"A ship is safe in harbor, but that's not what ships are for.." Some wise man once said. (or probably a drunk Mr. Pierce). But he did it again.. Here's today pearl by our roman warrior Gabriele Franco. 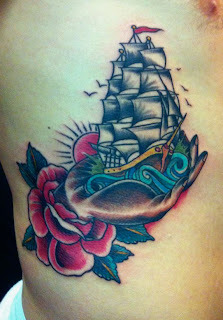 Inkstitution tattooing is a fully licensed, professional tattoo parlor, just outside the citycentre of Rotterdam. Currently we have 5 artist on the floor, with their own unique style and specialties. Inkstitution is always open for walkinns. Make sure you check back regularly for other guestspots of international allure at the Inkstitution..!! ALL ABOARD!! The Train of Flesh! A little bit of Thailand. Inkstitution. Thema Supercool. Mogelijk gemaakt door Blogger.